Cadence interconnect intellectual property (IP) tech experts will be on hand to answer questions and share best practices about enhancing system on chip (SoC) bandwidth and latency via Cadence Interconnect Workbench and Cadence Interconnect Validator. You'll be able to ask questions and share your ideas, too, during this interactive hour-long online session. The architect is using multiple interconnects to keep localized traffic from impacting the rest of the subsystems in the SoC. So how do you check that for example, burst is properly split on singles at target slave? Back to the diagram, the interconnect IP helps because it typically incorporates a number of features to tune each port for unique bus widths, address maps, and clock speed. Also, mechanisms for adjusting bandwidth and latency, referred to as quality of service (QoS) control, are used to tune the interconnect IP used in each domain. Great questions, keep them coming! The compartmentalization and configurability helps, but there will still be occasions when traffic conflicts occur. The arrows in this example indicated that three subsystems are trying to access main memory at the same time. So what happens here? Who gets priority? 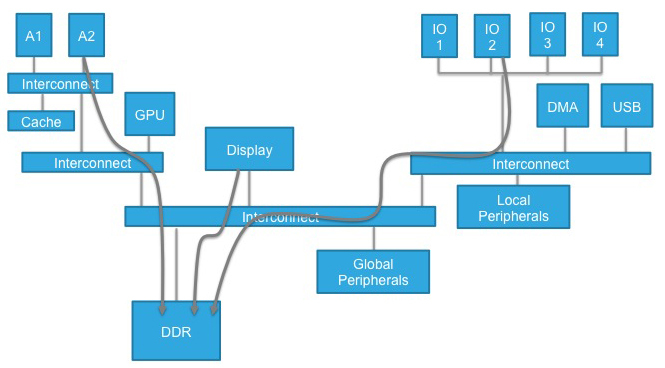 Is there enough bandwidth across the chip for the processors, display, and I/O? In most systems there is never enough main memory bandwidth to cope with ALL IPs being active at the same time, the key thing that systems designers care about is that the system performance degrades in a graceful way rather than one IP dominates and shuts out the others. This is where performance analysis comes in. So what is performance analysis exactly? OK, let’s go step by step. What is cycle-accurate modeling? Cycle-accurate means that the logic simulation will yield the same ordering of events with the same timing as seen in the actual chip. The RTL-level Verilog or VHDL created in the normal SoC design process is a cycle-accurate simulation model. Today, it is increasingly common for interconnect RTL to be generated as well. This automates an important step in creating a full-SoC cycle-accurate model. This is really important since we want to generate multiple variations of the interconnect IP to see what combination will yield the best overall performance.